We are a family of four from New Jersey. We love sailing, travel, yoga and anything to do with the beach. We stayed at the house for 3 weeks in November/December of 2012, and we liked it so much that we bought it! The location is perfect. The walk to the beach is short enough that the kids never miss a surf session and I never miss a sunset. The neighbors are great and everyone really felt at home here. Indoor and outdoor surf racks, outdoor shower, dead end street with two security guards patrolling the homes on the street at night, rental bodega to secure your items and renters safe, cell phone coverage if you have international plan, wireless internet. The beach is a very short walk less than 5 minutes. We just returned from our Playa Guiones vacation. Best ever! The house was perfect for our family. Paula and PVManagement are both responsive and so easy to work with. The house is extremely well equipped, comfortable beds, rooms and an ideal outside are to sit and listen to nature at night. The pool just a couple of steps outside the front door is also ideal. I would not hesitate to return. Easy walk to the most wonderful beach. Thanks! We thoroughly enjoyed our time here. Host was very accommodating. Would definitely stay here again. 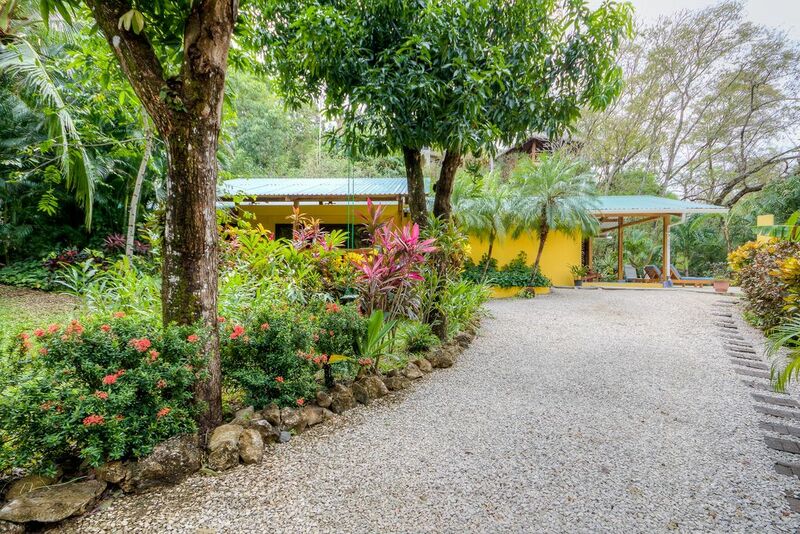 Casita Del Mar is nestled in a beautiful garden just off the beaten track. It is quiet, private, and very well appointed. The pool is partly shaded and perfect for repeated dips to escape the heat. The kitchen is well-stocked and the sleeping accommodations are very clean and comfortable, with two private ensuites and a third main bathroom. The gardener and housekeeper are lovely and the management staff very helpful. The beach and Aqua Tibia surf shop are just the right distance away - about 300m and 100m respectively. A perfect place from which to enjoy Playa Guiones. Great home - amazing location! We've stayed in many VRBO's around the world and this home in Nosara / Playa Guiones is easily one of the best! It's in a perfect location to easily access the beach, surf shops, and restaurants of Playa Guiones. The home is very clean and comfortable, and easily accommodated our family of 5 (it could accommodate more too!). The location is very secure and close to everything you'll need to have a great vacation. Definitely recommended! We absolutely loved Playa Guiones and our lovely home base there. I can't say enough good things about it. The house was big, super-clean, had all the amenities we needed, a nice pool, both indoor and outdoor racks to store the surfboards. The folks from the management company were very nice and responded very promptly whenever we reached out to them. Owner Paula was also very responsive and patiently answered all my questions and requests for recommendations as we got ready to head on our maiden voyage to Costa Rica. All the people we interacted with in stores, restaurants, etc., were lovely and I have to declare this one of the most relaxing vacations in recent memory. I certainly hope that we have an opportunity to visit again, and I have no hesitation whatsoever in recommending Casita del Mar to anybody going there! We thoroughly enjoyed ourselves. The place is everything that it is advertised to be! Quiet street, but close enough to town and extremely close to the surf. Perfect location with all the amenities you would expect. Highly recommended. Great deep sea fishing, close restaurants....walking distance, surf lessons available nearby, surfboard rentals nearby, consistent waves, tours including canopy tours and sea turtle observation. The howler monkeys enjoy our area due to food sources.